Data is one of the most vital business assets. In the case of an inevitable inopportune crash or disaster, a data backup solution is critical for the success of an enterprise. Backing up data is essentially storing a copy of all files and information in a secondary location. This is important if something were to happen to the originals. Data backup has become an increasingly critical role in decision making processes. If information were to be compromised or lost, the result could be costly and severe while potentially vandalizing the brand and reputation of a company. Since time is money, the loss of time to deal with data loss will consequently be a loss of money. With the increase of Internet bandwidth size, data backup has become a minor expense and much more affordable for businesses of all sizes. The most common of backup solutions have a rule referring to the 3-2-1 backup rule. This rule is known to be fail safe for any disaster. Firstly of the rule is to keep three or more copies of your data. Two backup copies should be stored on a different storage platform or device. One of which should be at a location off-site. Having a backup solution is a power platform for an enterprise to have. The solution would help to revive a company’s network in a timely manner in the circumstance in which systems fail. Data and employees will be able to continue crucial processes in no time. Many backup data solutions offer features with continuous data protection and block level encryption to give peace of mind to the user. These included features ensure that critical documents, emails, reports, and any other information are protected, backed up and safely stored away until needed. The option to backup via the cloud delivers replicated data across multiple data centers to make reliability and availability certain. Backing up data is easier than you might think. In many instances, solutions do not need the user to do the work, but instead will undergo the backup automatically. The bottom line is that data backup is extremely necessary in guaranteeing success for a company. Disasters and errors are inevitable, so being proactive about backing up crucial data will eliminate any and all negative consequences that result from failures to backup. Improving data backup and recovery over the next 12 months is the number one priority for IT departments of mid-market organizations. 96% of all business workstations are not backed up. Human error resulted in 58% of downtime, while natural disasters account for 10% of downtime. 35% of servers have a downtime tolerance of 15 minutes or less. Hardware failure is the leading cause of incidents and outages, followed by environmental disasters and miscellaneous outages. 35% of companies that lost their data center for 10 days or more during an outage, filed for bankruptcy within a year of the disaster. Among the companies that suffered from tragic data loss, 43% are unable to reopen and 51% close within 2 years. In the case of a fire, 30% of businesses affected close within a year and 70% fail within 5. It costs between an average of $25,000 to $50,000 per hour of downtime. With 100 to 2,000 employees, companies experience roughly $20,000 worth of costs in the case of a disaster. 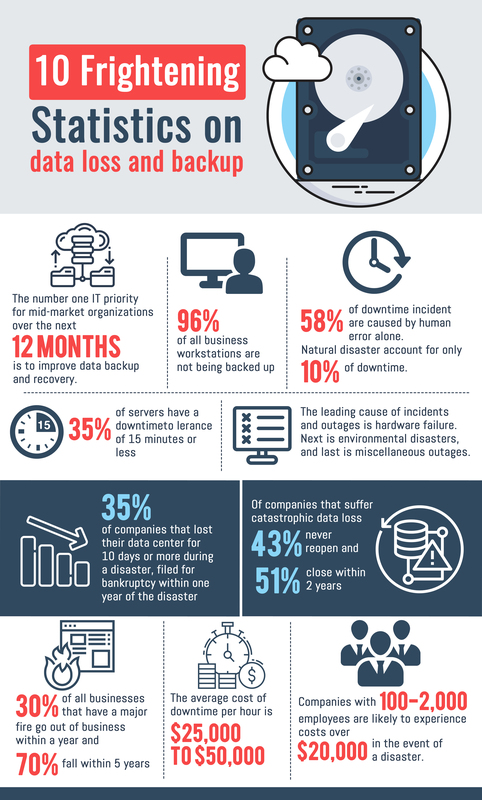 Avoid becoming apart of these catastrophic data loss statistics by backing up your enterprise’s data now. The process can be simple, automated and secure all the while constantly protecting your business in the background. Get ahead of possible imminent errors and disasters that threaten your secure information and company.